A bravely honest and brilliantly comic account of how one mother gave up drinking and started living this is Bridget Jones Dries Out. 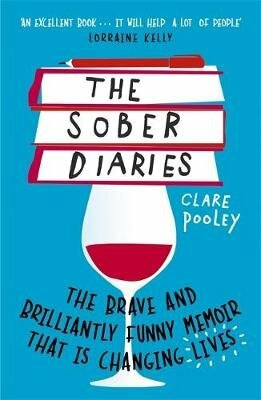 Clare Pooley is a Cambridge graduate and was a Managing Partner at one of the world's biggest advertising agencies, and yet by eighteen months ago she'd become an overweight, depressed, middle-aged mother of three who was drinking more than a bottle of wine a day, and spending her evenings Googling 'Am I an alcoholic?' In a desperate bid to turn her life around, she quit drinking and started a blog. She called it Mummy Was a Secret Drinker. This book is the story of a year in Clare's life. A year that started with her quitting booze having been drinking more than a bottle of wine every day. It sees her starting a hugely successful blog, then getting and beating breast cancer. By the end of the year she is booze free and cancer free, two stone lighter and with a life that is so much richer, healthier and more rewarding than ever before. Sober Diaries is an upbeat, funny and positive look at how to live life to the full. Interwoven within Clare's own very personal and frank story is research and advice, and answers to questions like: How do I know if I'm drinking too much? How will I cope at parties? What do I say to friends and family? How do I cope with cravings? Will I lose weight? What if my partner still drinks? And many more.